Derek Gedalecia, a.k.a. 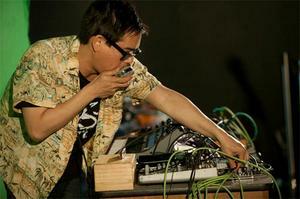 Headboggle, has been performing electronic keyboard-based soundscapes for several years in the Bay Area in over a hundred local performances at venues ranging from GTK to YBCA. Incorporating lowbrow with highbrow art, music, and comedy, Head Boggle’s intent is to fuse together a new ecstatic improvisational performance style with a carefully crafted musical underbed. In his formative years, Gedalecia studied classical and ragtime piano from noted ragtime composer/revivalist Dr. Brian Dykstra. Caitlin Denny is a California-based video artist and has presented and lectured at Sonoma Valley Museum of Art, Little Paper Planes Gallery, SOMArts and SFAI as well as others. She is curator of the web-based project JstChillin, an internationally known landmark net.art project. She is currently working on an experimental documentary with Miles Votek called Atlantis Rising which will be her third live A/V collaboration with Headboggle.